(Nanowerk News) New findings by a UCLA-led international team of researchers answer a fundamental question about our space environment and will help scientists develop methods to protect valuable telecommunication and navigation satellites. The research is published in the journal Nature Communications ("Wave-induced loss of ultra-relativistic electrons in the Van Allen radiation belts"). Using measurements from the first U.S. satellite that traveled to space, Explorer 1 physicist James Van Allen discovered in 1958 that space is radioactive. The Earth is surrounded by two doughnut-shaped rings of highly charged particle radiation -- an inner ring of high-energy electrons and positive ions and an outer ring of high-energy electrons -- that are now known as Van Allen Radiation Belts. Flying close to the speed of light, the high-energy particles that populate the belts create a harsh environment for satellites and humans in space. In recent years, there has been much scientific interest in understanding the Van Allen belts. New technologies now require that telecommunication satellites spend a great deal of time in those belts and that GPS satellites operate in the heart of the belts. With the increasingly smaller size of space electronics has come greater vulnerability of satellites to space radiation, according to Yuri Shprits, a research geophysicist with Earth, Planetary and Space Sciences in the UCLA College and a member of the international team. The particles that are most dangerous to spacecraft are known as relativistic and ultra-relativistic electrons. The ultra-relativistic, or "killer electrons," are especially hazardous and can penetrate the most protected and valuable satellites in space, Shprits said. While it is possible to protect the satellites from relativistic particles, shielding from ultra-relativistic particles is practically impossible, he added. Understanding the dynamics of these particles has been a major challenge for scientists since Van Allen discovered space radiation. Since the late 1960s, scientists have made many observations to try to understand the loss of electrons from the Van Allen belts. One of the proposed theories was that particles are scattered into the atmosphere by electromagnetic ion cyclotron waves. These waves are produced by the injection of ions that are heavier than electrons and carry a lot of energy. These waves can potentially scatter electrons into the atmosphere. Up until recently, that remained the most likely candidate for the loss of electrons. In 2006, Shprits and colleagues proposed another mechanism. They suggested that more than 99 percent of the particles suddenly were lost, as electrons diffused into interplanetary space, no longer trapped by the Earth's magnetic field. The team conducted additional studies that provided more evidence for this mechanism. The scientists' modeling of large numbers of electrons at relativistic energies seemed to favor this mechanism and did not require the scattering of electron by electromagnetic ion cyclotron waves. However, it remained unclear which mechanism operated or dominated during storms, and which mechanism explains the most dramatic dropouts of electrons in the space environment. The loss of particles is difficult to pinpoint. Both types of loss mechanisms are intensified during storms, making it difficult to distinguish one from the other. Fortunately for the scientists, several factors combined to help them resolve the dispute. A January 2013 storm in the Van Allen belts allowed the researchers to use detectors to measure the particles' distributions and direction. The most intense relativistic and ultra-relativistic electrons were discovered in different locations in the belts. 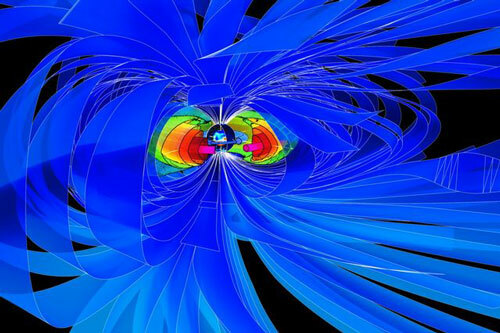 And the ultra-relativistic particles were located deep inside the magnetosphere (and were not affected by the electron loss to the magnetopause, which is the boundary between the Earth's magnetic field and the solar wind). The researchers' detailed measurements -- including particle speed, velocity direction and radial distributions -- all showed that the waves were indeed scattering particles into the atmosphere but affected only ultra-relativistic electrons, not relativistic particles. "Our findings resolve a fundamental scientific question about our space environment and may help develop methods of cleaning up the radiation belts from harmful radiation and make the environment around the Earth friendlier for satellites," Shprits said. He is principal investigator of an April mission in which a satellite containing a UCLA-built collection of instruments was launched from Vostochny, Siberia. That work is expected to provide scientists worldwide with measurements of radiation in space and advance space sciences for years to come.